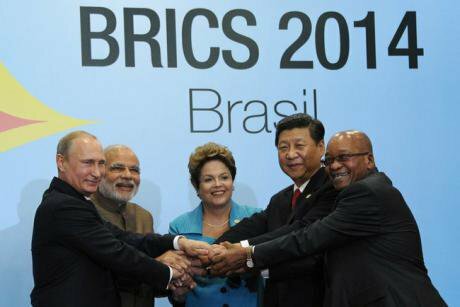 BRICS summit 2014. President of Russia Vladmir Putin, Prime Minister of India Narendra Modi, Former President of Brazil Dilma Rousseff, President of China Xi Jinping, President of South Africa Jacob Zuma. Credits: www.kremlin.ru/Wikimedia Commons. Some rights reserved. This month, the BRICS New Development Bank (NDB) concluded its second Annual Meeting, under the theme of “Building a Sustainable Future”. Now that the NDB is up and running and issuing financing for development projects, a key question on the minds of those watching the bank, is what is the NDB’s strategy for sustainable development? The NDB, launched by the governments of Brazil, Russia, India, China and South Africa in 2015, began slowly and cautiously with several small-scale energy projects in each of the BRICS countries. The institution is now eying larger infrastructure investments as it sets ambitious targets to expand country membership, move into the private sector, and double lending annually. As the NDB finalizes a five-year strategy to chart the institution’s future course, it still remains for now the new kid on the block, with only 10 billion USD in available capital as compared to its much larger sister, the Asian Infrastructure Investment Bank with 57 founding members and subscribed capital of 100 billion USD. If it is to make its mark it will be from how it does development finance, not how much development finance it does. The NDB was created with an aspiration of promoting transformative infrastructure and sustainable development through South-South cooperation. And in that regard, it has adopted some interesting innovations, such as lending in local currency. In its Social and Environmental Framework, the NDB sets forth some interesting core principles, including inclusive and sustainable development, climate change, and gender equality. Yet to make this vision a reality will require a clear strategy that includes bold investment targets and clear sustainability criteria for project selection and evaluation. Sustainable development is no easy mission and it doesn’t happen without a clear plan. The NDB needs to take conscious steps to avoid the trap of the development banks that have gone before it – financing ill-conceived mega-infrastructure or extractive energy projects that may be a boon to a few corporate elites, but do not actually serve national development. In many cases these projects have actually exacerbated the “underdevelopment” of the Global South – stripping away productive resources and natural capital, while increasing poverty. Born at the same time as the Paris Agreement on Climate, the NDB must use that agreement as its guiding principle. In this way, to be truly environmentally sustainable, the NDB must make a bold commitment to prioritize low-carbon, resource efficient, clean technologies that limit pollution, support climate mitigation, and protect biodiversity and critical habitats. The NDB should prioritize investment in appropriate-scale infrastructure and renewable energy projects, such as wind and solar, which often have less access to financing. It should refrain from investing in fossil fuels or large-scale hydropower projects that bring significant adverse impacts for the climate as well as for the health and livelihoods of local communities. In this way the NDB could strategically position itself as leverage for developing countries to access the large amounts of global climate finance and to position themselves as a solution to climate change and the future of a decarbonized economy. Regarding social sustainability, the NDB must enact strong standards and undertake due diligence to avoid adverse impacts, such as forced evictions or labor abuses, that often come with traditional infrastructure development. To actually be a force for development, NDB will need to explicitly prioritize pro-poor, transformative investments that address inequality and exclusion. Projects should be gender-responsive, appropriate scale solutions that increase access to affordable, quality, goods and services, especially for the extreme poor and the most marginalized populations. This means looking at innovations in social infrastructure such as housing, education, and health and sanitation facilities, as well as off-grid solutions to promote affordable energy access to underserved populations. Most importantly, the NDB needs a sustainable modus operandi. That means promoting public participation in development processes and being accountable to those who will be impacted by its financing – those who ideally should be the beneficiaries of development. The NDB has up until now operated largely in the dark, with little to no transparency about proposed projects or real engagement with civil society. To operate sustainably and ensure that projects actually meet local development needs, the NDB must develop formal mechanisms for meaningful consultation with and participation of affected communities and civil society groups in project design and implementation as well as policy and strategy development. The NDB will also need an effective accountability mechanism to resolve complaints from local communities. Charting a direction for a development bank that is truly new and sustainable is not easy. It will require the NDB to be both bold in its commitment to social and environmental sustainability and inclusive in its execution.